When Winnie Byanyima arrived in Britain, a frightened 17 year-old fleeing Idi Amin’s brutal regime, she was immediately arrested. The $300 pressed into her hand by her mother as they parted ways in Kenya – after crossing the Ugandan border together under cover of darkness – turned out to be fake. Ms Byanyima was found out as she tried to change the black-market notes into sterling at the airport. “The policeman looked at me crying and saw I was an innocent young girl,” she says, chuckling softly now about the ordeal. “He tore up the money and advised me never to get any except from a proper bank. The story doesn’t end there. When the police had finished with her, on that day nearly 40 years ago, she eventually met her sister who was already living in England. The choice of charity shop proved fitting. Ms Byanyima has gone on to fight global inequality as the executive director of Oxfam International. We have found a quiet bench to talk in the congress centre at the World Economic Forum in Davos. It is Saturday morning. Many of the delegates from the annual gathering of the world’s corporate and political elite have boarded their private jets home. But, as if to demonstrate you are never far here from the rich or powerful, Bank of England Governor Mark Carney sweeps by on his way to a private meeting. Ms Byanyima, 56, co-chaired this year’s event and tried to frame a debate around closing the huge gap between the haves and have-nots. The Oxfam survey which pointed to the 1 per cent of the world’s population being wealthier than the other 99 per cent by next year was an early talking point. Davos’s convening power means it is regarded as an excellent place to raise issues – but rarely identifies solutions. Ms Byanyima insists that corporations agree about the benefits of investing in education and training in developing nations to create a skilled workforce. But she bristles when I ask if any of the billionaires in town this week wrote her a large cheque. She prefers to win consensus for a minimum wage, which relies on public policy, not private donation. Where corporations might do better is on tax. Some of the world’s biggest companies, she says, “have been participating in an unhealthy tax competition, a race to the bottom. They push governments to lower taxes or to give them tax holidays and these poor countries especially have no choice to compete for companies to come to invest”. The Oxfam way is to appeal to their conscience, if not their wallet. “If I sensitise them about this, divide them, have a few of them who think that’s fair, get someone on my side,” then she can push for “common rules”. Even Ms Byanyima didn’t realise how big Oxfam was until she got the job. A confederation of 17 national organisations, as far afield as Mexico and India, it employs almost 10,000 people and is active in 96 countries with a €1bn (£747.4bn) annual budget. Some of its biggest projects are currently in Sierra Leone and Liberia – where it is bringing fresh water and health education in response to the devastating Ebola outbreak – and in Gaza, where it is distributing food vouchers and hygiene kits with partners. Ms Byanyima’s campaigning zeal can be traced back to her father, a local politician in Uganda and her mother, a women’s rights activist. The childhood home, shared with five siblings, became a centre for resistance against the Amin dictatorship. Her father’s political party was banned, so he was in and out of jail after refusing to cross over to the ruling party. As a student, Ms Byanyima was a good “all-rounder”, and encouraged to study sciences. That led to a degree in aeronautical engineering “out of curiosity” from Manchester University. But despite working briefly as airline crew, a career in aviation was never going to keep her satisfied. She returned to Uganda when the Amin regime collapsed but democratic elections were hijacked. She joined a new “peasant struggle” for liberation, finding refuge in the jungle as a member of the National Resistance Army. Its leader, Yoweri Museveni, now the long-serving president of Uganda, had grown up with her in her parents’ home. The rebellion’s victory launched Ms Byanyima into a life of politics and diplomacy that has taken her around the world. “I have learnt to enjoy my own company because I have lived alone many years,” she says. Even now her husband lives in Uganda, where they keep a farm. She doesn’t return enough. “I miss the community,” she sighs. Meanwhile, her son, Anselm, is at boarding school in Connecticut, having pressed his mother to let him stay where he had lived for half his life after she got the Oxfam job. 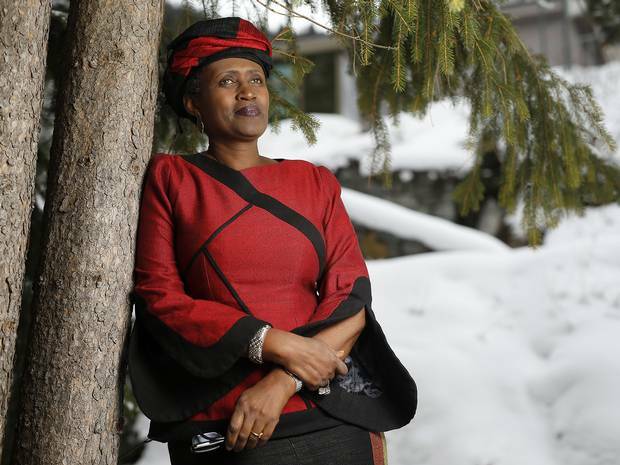 In fact, she is the first African to run an international development agency. Ms Byanyima has taken over at a time “when the organisation has to reinvent itself, has to change its character, the way it locates itself. That is exciting but I am also seeing the resistance that comes with that change”. Rather than simply delivering support programmes around the world, she wants to create a sense of permanence by setting up a series of local organisations with local leadership that sit within her global network. Unsurprisingly, she is supportive of David Cameron’s commitment to spend 0.7 per cent of Britain’s national income on international development, an absolute figure that rises as the economy recovers. Other governments which have cut their aid budgets are “going back on their commitments and especially we are critical of some G7 members. I think they should show leadership because the aid budget is so small”. There are other issues that she still champions, such as gender equality, something actress Emma Watson came to Davos to talk about. Much has improved, she says, but there are “other issues that can’t be resolved with quotas, such as women’s self-confidence”. As she worked her way through the congress centre last week, it is not something Ms Byanyima lacked. Education: Studied at Mount Saint Mary’s College Namagunga in Mukono, Uganda. After fleeing to the UK, she gained an aeronautical engineering degree from Manchester University and, later, a Masters in mechanical engineering from Cranfield. Career so far: Worked briefly as a crew member for Uganda Airlines. After the civil war, joined the diplomatic service, representing Uganda in France and at Unesco. Served as a member of the Ugandan parliament for 10 years from 1994. After working for the African Union Commission, she led the gender team at the United Nations Development Programme in 2006. Executive director of Oxfam International from 2013. Personal: Married to Kizza Besigye, former presidential candidate and chairman of Ugandan political party the Forum for Democratic Change. She lives in Oxford, close to Oxfam’s headquarters, while he lives on a farm in Uganda. Their 15-year-old son, Anselm, is at boarding school in Connecticut. US, but she says: “We Skype every week.” She relaxes by walking in the English countryside.